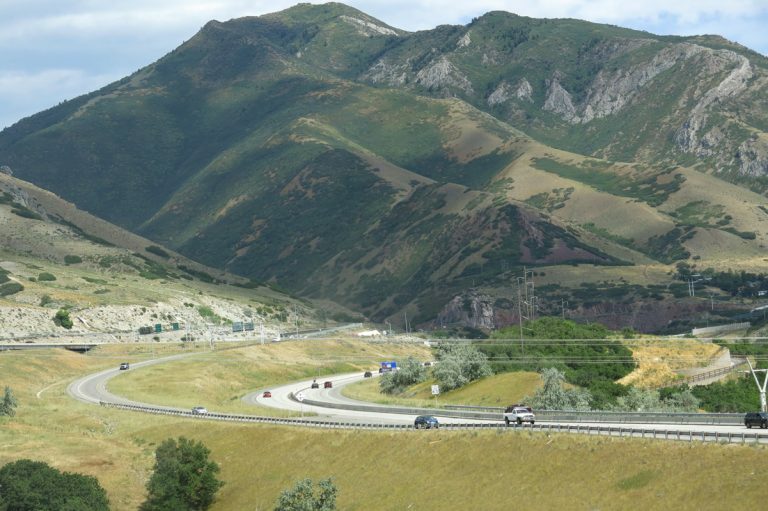 With Grandeur Peak overlooking from the east, the western prong of Interstate 215 travels along side Parleys Creek between I-80 at Sugar House, Utah and Canyon Rim in east Salt Lake Valley. Photo taken 08/05/13. The Interstate 215/Belt Route provides a bypass and commuter route for the city of Salt Lake City. 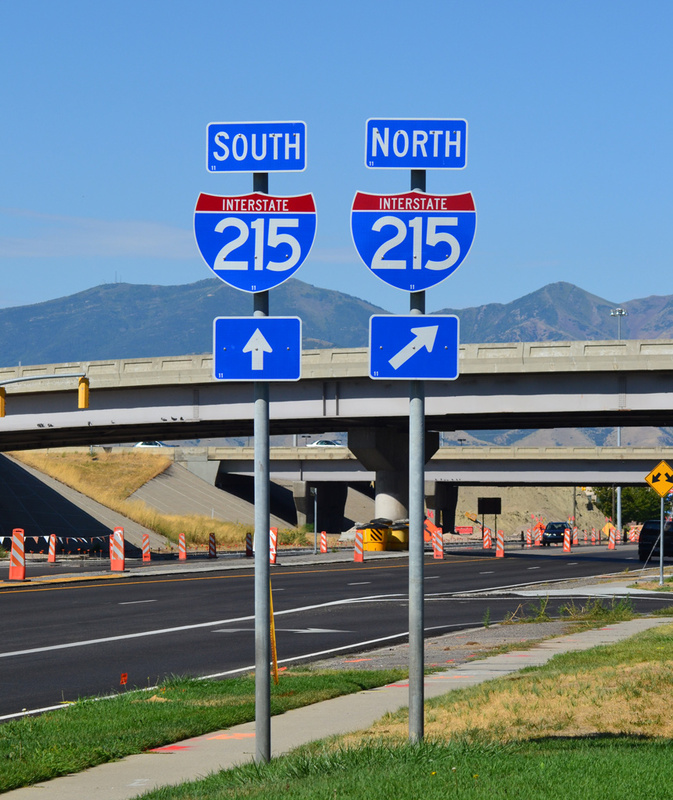 The 28-mile freeway allows Interstate 15 through traffic bound for Ogden or Provo or motorists headed to Salt Lake City International Airport (SLC) to bypass the city center by use of the western two thirds of the beltway. The southeastern leg of the highway serves residential areas of Cottonwood Heights and Holladay as it joins Interstate 15 with I-80 at Parleys Canyon. Two sections of Interstate 215 remained under construction in 1986. The western portion by SLC Airport opened on October 7, 1988. These Interstate 215 route markers are posted on northbound Utah 171 (3500 South) in West Valley City. Photo taken by Garrett Smith (08/28/11). 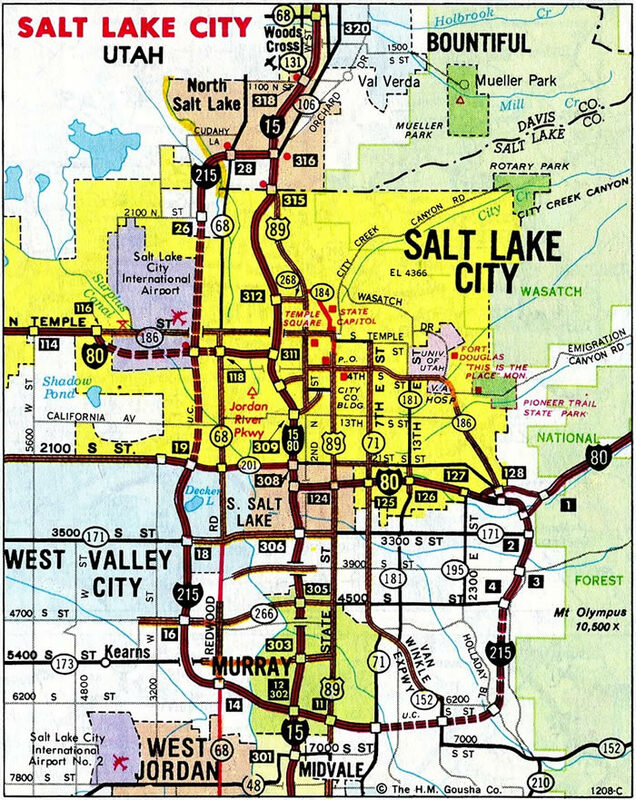 Historically, the Salt Lake City Belt Route was numbered as Interstate 215 west of I-15 and Interstate 415 east of I-15. The I-415 portion was renumbered as an extension of I-215 by 1969. 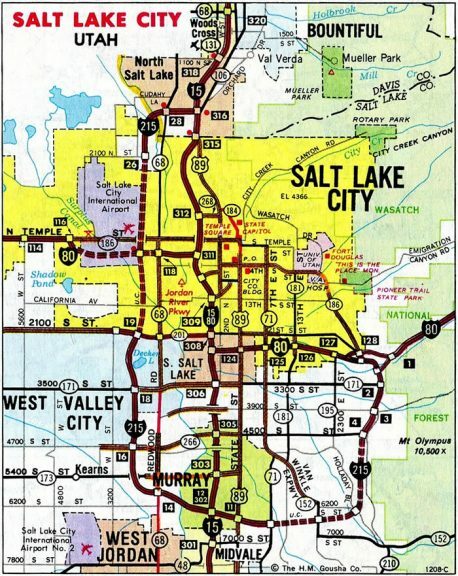 1960s completed portions of the beltway served local traffic both at Murray to the south and toward Salt Lake City International Airport (SLC) to the north. The 20-mile route was slated for completion by 1972, but community opposition and subsequent litigation delayed construction on the southeast quadrant until 1979. Completion of the beltway did not occur until 1989. For a more in depth history of Belt Route, see Interstate-Guide: Interstate 215 Utah.